Sadly incidence of breast cancer is rising, particularly in younger women. In fact 1 in 9 women can expect a diagnosis of breast cancer in their lifetime. Consequently, we recommend regular breast screening checks using the pain-free, radiation-free safe alternative to mammograms called Breast Thermography. Breast Thermography uses state of the art technology which scans the breasts using an infrared camera to produce a “thermogram”. Thermocheck® system detects any abnormal heat and vascular patterns indicating infection, inflammation or a breast tumour. Breast tumours tend to have abnormal blood vessel patterns and increased metabolic activity that give off more heat than the surrounding tissue. These heat changes can occur between 6 and 10 years before a tumour is big enough to see on a mammogram. Therefore detecting this heat can enable earlier intervention and reduction of risk. The blood vessel growth that accompanies tumour formation is termed neovascularization or angiogenesis. Neovascularization is the earliest sign of a rapidly growing tumour and can be detected with infrared technology. The thermograms obtained provide an indirect measurement of the metabolic activity of breast tissue. In other words, abnormal tissue is identified on a thermogram as focal ‘hot spots,’ disturbed cooling response and abnormal blood vessel patterns. Cancers are associated with increased temperature and abnormal blood vessel patterns, both detected by Thermocheck®. Where can I have a thermography scan? Breast thermography with Thermocheck® take place at our Harley Street Clinic in Central London in our private breast screening room. ARE THERE ANY PREPARATIONS I NEED TO FOLLOW BEFORE MY SCAN? In order to achieve the highest accuracy, it is compulsory to follow our standardised protocols. These are always emailed after booking your appointment. Your thermography appointment will take approximately 30 minutes with one of our female scan technicians. If you are concerned about your breast health and prefer to discuss your breast thermography results on the same day straight after your scan with a breast health specialist, we offer an option of booking a scan and consultation with Dr Eccles, the founder of Thermocheck® on the same day. At what age should I start to have Breast Thermography? At The Natural Doctor®, given the incidence of breast cancer nowadays in younger women, we recommend a thermography screen for women of all ages from 20 onwards. We recommend a regular annual Breast Thermogram much like a regular dental check-up. 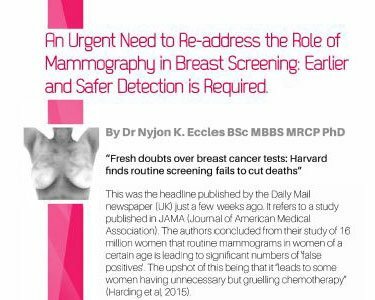 Patients with abnormal scans or with breast cancer history will be recommended more regular checkups. 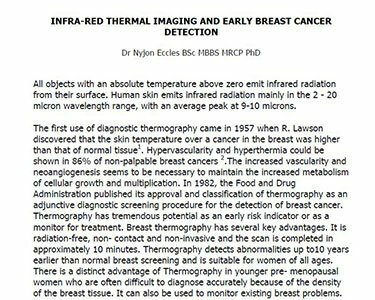 Want to know more about Dr Eccles and Thermography?